So as a life-long musician and long time worship leader why didn’t I know these simple biblical truths about music and instruments in the Bible? The truth is I just never thought it was that important. But my opinion on that has changed about a year ago when I was singing “Days of Elijah” and realized I had no idea what “Out of Zion’s Hill salvation comes” meant. That small wakeup call made me realize that I was singing a song that I didn’t know the true meaning of, and I was singing about a time in history that I didn’t have a musical grasp of. And that’s just not acceptable for someone called to lead worship. So now when I’m worshipping with music and singing you won’t catch me saying things like “God I give you all of my attention all the days of my life,” because I know I don’t. I won’t sing a song ever again that I don’t understand. And now I will be able to hold a conversation about Old Testament instruments because I now consider these things to be at least equally important to memorizing the 53-man roster of the 2007 New York Giants football team. 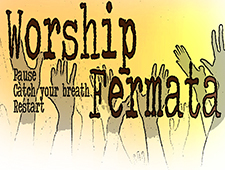 This entry was posted in Worship Fermata by Worship Fermata. Bookmark the permalink.